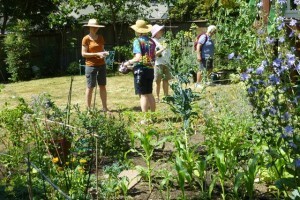 Now in it’s 9th year, the Edible Garden Tour has been an inspiration to hundreds of gardeners every summer. 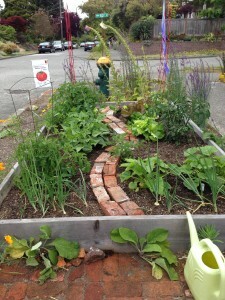 This fun walking / biking tour highlights neighborhood gardens, planting strips, containers, raised beds, chickens, bees and all sorts of creative edibles from fruit trees to berries to veggies galore. Mark the date Saturday, July 1st on your calendar and join your neighbors as they show off their containers, chickens, bees, goats, fruit & nut trees, berries, raised beds, aquaculture, kiwi vines, vertical gardens, permaculture – all styles of food production! Our goal is to educate and inspire folks to grow food by giving examples of creative uses of parking strips, containers, raised beds, chicken coops, fruit trees, berries and more! Meet the gardeners and ask questions. The tour includes ten or more gardens to explore within walking distance of Kirke Park. The $10 ticket supports Sustainable Ballard’s community projects. Saturday, July 1st, 10am – 3pm. Buy your ticket / map at Kirke Park, 7028 – 9th Ave NW on the day of the tour. This year’s tour will be in the northeast part of our neighborhood, between NW 85th and 65th Streets and 8th and 15th Avenues NW. If you’re interested in working on this fun project, get in touch with Paula.